“Swift in body and mind, Cheetah sprints ever forward. A blur of pure instinct. Buena Onda. Pure, crisp, clean, blissful simplicity. Savor this moment. All we have and all we need is now. Feel free and therefore you are free.” That statement can be found on every can of Cheetah Lager that comes out the Cincinnati, Ohio, -based brewery. The idea behind this beer was to create a sessionable lager that was perfect on flavor, but not too dominating to prevent drinking in copious amounts. The beer is 4.8 percent, and as the can says, it’s bright, clean, and simple. There’s an underlying citrus pop to the beer that creates a wonderful summertime/early fall drink that’s refreshing while still holding enough character to keep your palates entertained. 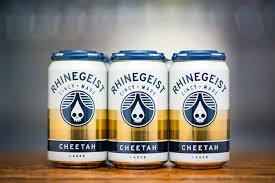 Cheetah is fairly new to the Rhinegeist stable – as in it just came around this summer in a limited fashion. But, this beer struck a cord quickly with Rhinegeist visitors. And by struck a cord, we mean how can we get this beer outside of the brewery. Being a lager, Rhinegeist’s Cheetah is ahead of the curve as lagers are becoming the next big thing with small to mid-sized craft brews. Breweries are looking to the past and the way things used to be done to draw inspiration for flavor and process. Back in the day, there was no temperature control, so beer would often be allowed to ferment in cool cellars or caves. The beer yeast adapted to this, hence the evolution of the lager strain of yeast – known as Saccharomyces Pastorianus. Appearance: Yellow in color, fairly clear. Frothy white head with average retention. Medium carbonation. Aroma: Light sulfury aroma quickly dissipates to a moderately-low grainy/cereal aroma. No esters, very low hop aroma. Taste: Medium-low malt flavor, light cereal, grain, and cracker-like notes. Low hop bitterness, dry finish. No esters. Mouthfeel: Light body, medium carbonation, low astringency, no alcohol warmth. Overall: A clean, crisp, yet flavorful craft lager that falls squarely in the Rhinegeist wheelhouse. 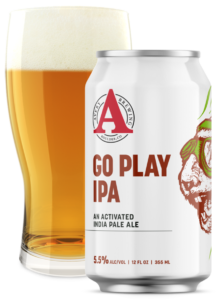 Avery Brewing Company, a pioneering craft brewery known for its all-encompassing obsession with beer, has introduced its Go Play IPA – a new year-round beer. Avery Brewing crafted the Go Play IPA as a celebration of those who do their thing, regardless of what it is, with the same all-in obsessive enthusiasm that they have for beer. The Go Play IPA sports – as quoted by their website – juicy, tropical, and dank aromas, fueled by dry-hop additions of Vic Secret, Idaho 7, and Simcoe hops. The addition of sodium and potassium and the near-sessionable 5.5% ABV make Go Play the perfect beer to handle hot days without having to compromise on flavor. Taking cues from the Michael Gose playbook, Avery Brewing Company applies the rounded salinity of that sour ale to the crowd-pleasing IPA. Activated with electrolytes and a sensible alcohol content, the Simcoe, Vic Secret and Idaho 7 hop fueled IPA brings a refreshing and hydrating beer vibe to athletics. Adam Avery , Founder and CEO of Avery Brewing Co., said that this beer was the beer he’d been dreaming of creating for years. Outside of running the Boulder, Colorado, brewery, Avery spends a lot of his time rock climbing and mountain biking. He wanted to create a beer that was light and refreshing but didn’t skimp out on flavor. Typically, to create a sessionable beer that can be drunk on a warm day and not be incredibly dehydrating, it needs to be beyond light and borderline flavorless. For Avery, this proposition was unacceptable. Like most people, living an active lifestyle needs a beer to tag alongside. Taking cues typically found in sports drinks, Avery concocted an IPA that not only felt refreshing but was also full of flavor. Go Play IPA reaches more sessionable IPA status while ultimately becoming a pale ale with a stronger hop tilt. Dry, crisp and refreshing throughout, the beer closes with the promised and rounded salinity that plays lightly on the finish for a snappy texture but slightly fuller taste with a medium-long grip of hop bitterness on the throat. Pale, golden, and hazy, the frothy ale draws in the nose with a host of tropical fruit, citrus, and herb. Gentle sweetness carries a nutty, lightly honied and caramelized taste that brings thoughts of trail mix and graham cracker. With the mineral-rich ale splashing against the middle palate, its refreshing tone takes hold with a hop-centric demeanor. Papaya, passionfruit and red grapefruit rise first, with orange, apricot and a strong herbal contingency coming in a moderately bitter late palate. A light briny solution intertwines with impressions of fruit juice for a hint of Pedialyte in the finish. Be sure to stop by any of our locations and pick up a 12-pack of Go Play IPA today! What’s Irish, black, and distinctive in harmony? Guinness. The brand has been around more than 250 years, and while it’s iconic product is the original Guinness Draught, the brand has evolved over time. Adjusting to taste and preferences of its consumers is key. Guinness brew masters spin traditional methods in new ways to appeal to taste buds all around the world. From the Blonde American Lager to the Dublin Porter and Golden Ale, Guinness is broadening its options for beer lovers everywhere. But how did this iconic brand get so popular? It started with Arthur Guinness, an Irish native with a relentless passion for creating brews people will love. At 34, Arthur took a stab at his own brewing. In 1759, he signed a 9000-year lease on a small, unused property to start off. Ten years later, six and a half barrels of Guinness beer left Dublin on a sailing ship for England. The small voyage marked a small victory for the future of Guinness beer. His 9000-year lease proved to be a good investment as Guinness grew rapidly, advancing with more flavors and brews. In order to perfect the areas of brewing, Arthur ceased brewing of ale in 1799 to focus on porters, a black beer in London that became popular in Dublin. Mastering the science of brews has paid off, as Guinness is now enjoyed and loved all over the world. With St. Patrick’s Day coming up, now is the perfect time to stock up on Guinness, or try it if you haven’t before! But wait, there’s more. 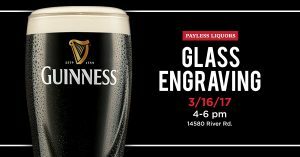 You can even engrave your own glass at our upcoming event on Thursday, March 16th. Get the details here, then mark your calendars so you don’t miss this unique experience! 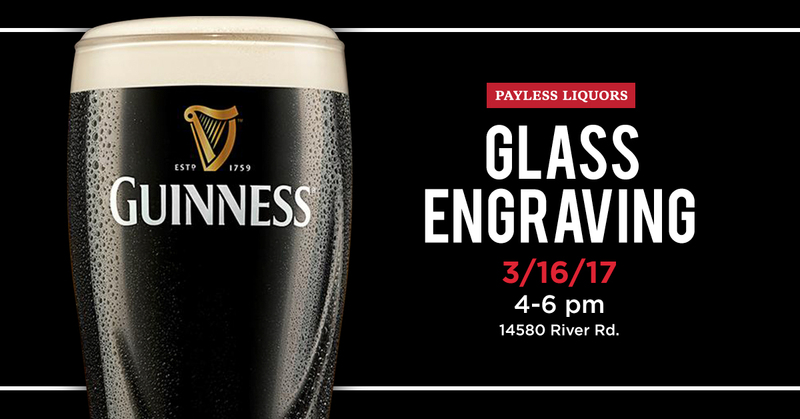 You’ll have a customized Guinness glass to rave about just in time for St. Paddy’s Day. Hope to see you there. Cheers! What is the oldest brewery in America? Like other stories of the first American immigrants, the founders of Yuengling settled in the United States looking for opportunity to build a legacy and lasting impression in their new home. The story begins with David G. Yuengling traveling from Wuerttemberg, Germany to settle in Pottsville, Pennsylvania. David established the Eagle Brewery in 1829, but a tragic fire destroyed the plant two years later. A new brewery was then established at its current site in Pottsville. After David’s son joined him in 1873, the brewery name is changed to D.G. Yuengling & Son, which is its common name today. The brewery has been family owned and operating since its beginnings. But the company has had its struggles. When the eighteenth amendment was ratified, Yuengling was forced to switch production to near beer products, also known as non-alcoholic beers. They even opened a dairy to help survive prohibition. But when prohibition ended, they celebrated by producing “Winner Beer” and shipping a truckload to President Franklin D. Roosevelt. Winner Beer isn’t available today, but the family has developed a brand any beer lover knows. The brand became so popular that the demand for Yuengling exceeded the brewery’s capacity, so in 1966 they decided to withdraw sales from outside the local area. The company built two additional breweries to help meet demand of the product, and by 2009, they surpassed 2 million barrels in production. Thankfully the product was expanded to Ohio in 2011, and this year, they will be coming to Indiana! 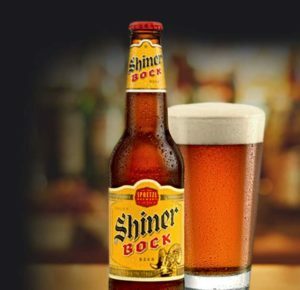 It’s taken 188 years, but America’s oldest brewery is finally hitting Indian a shelves. 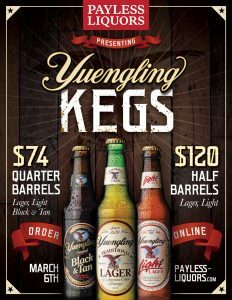 Yuengling lovers in Indiana are ecstatic, and you can be one of the first to have your hands on some of this iconic beer. 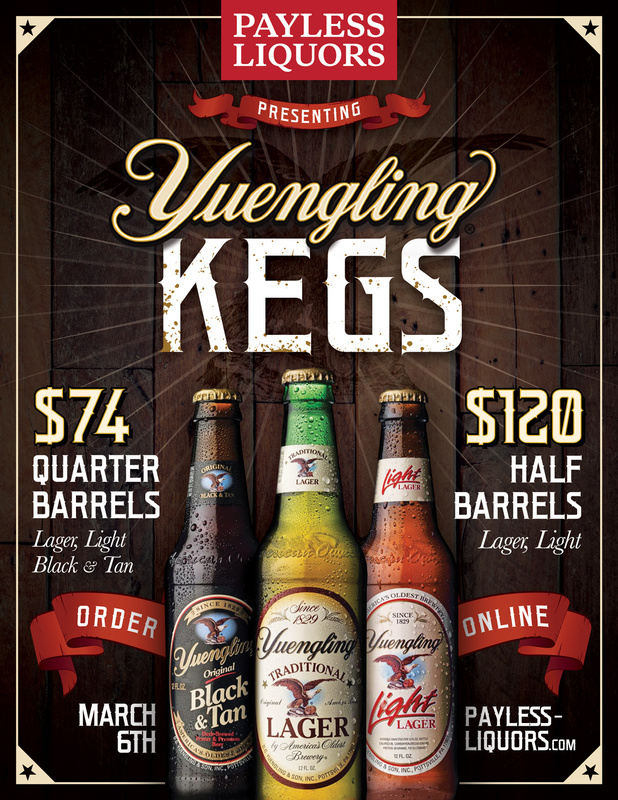 Through Payless Liquors, you can pre-order your keg of Yuengling and have it by March 6th! Check out our keg order form for more details and to order your keg today. Yuengling will also be available in bottles and cans in April. Stay up to date on Yuengling coming to Indiana on Payless Liquors Facebook, Twitter, and Instagram! One of Indiana’s most well known craft breweries, Three Floyds was founded in 1996 by Mike Floyd and his 2 sons Nick & Simon. They moved to Munster in 2005 and have since added a brewpub across the street. The Floyd’s started with just a few hundred dollars, a small system, and a love of brewing. They always strive to make the best and most memorable beers that leave no doubts in drinkers mind that they just had a Three Floyds lager or ale. This is especially true for 2 of their most well known brews – Gumballhead and Zombie Dust. Zombie Dust is an intensely hopped pale ale that was created with their friends in the comic industry. The head has a yellow tint from the body of the beer which is a slightly hazy dark yellow. The Citra hops used give off tropical fruit notes of tangerine, mango, and lemon grass. The taste is impressive, with a bittering pull towards the front and middle palate, followed by a short malt kick, and then grassy, lemony, lingering hop dryness. Gumball head is a hopped session American wheat beer brewed with a boatload of Amarillo Hops. A vibrant straw yellow, Gumballhead is a crisp refreshing beer perfect for summer. The Amarillo hops produce notes of grapefruit and lemon zest with a slight pepper smell. The flavors balance out perfectly with a burst of lemongrass and citrus fruits and during the swallow the wheat character shines through and the finish is somewhat tart and dry. Three Floyds refuses to compromise on the quality and flavor of their beer and you shouldn’t either. Zombie Dust and Gumballhead are available for a very limited time. Contact us to find a 6-pack today. In honor of all the Dads out there, this week on our blog we’re highlighting Small Town Brewery’s, Not Your Father’s Root Beer. It’s silky, smooth unmatched flavor is the perfect beverage to celebrate dad this weekend. Looking for a beer that smells and tastes exactly like your favorite fountain pop Root Beer? Then this is the beer for you. The fermentation process brought out by Small Town includes several natural ingredients including: honey, vanilla, cinnamon, wintergreen and sarsaparilla bark. Although Not Your Father’s is a highlight acclaimed beer, some critics don’t even consider it a beer because it lacks on critical ingredient essential to beer, hops. But this hasn’t stopped it from being wildly popular among enthusiasts. The 12-ounce, 5.9% ABV bottles pour dark cola brown with a slight caramel color. In comparison to actual root beer, it’s a little stickier and not nearly as fizzy. But as we mentioned before, all the aromas are reminiscent of soda with sweet honeyed vanilla and sassafras spice. There is a subtle boozy note to it, sort of like a spiked root beer. Flavors of black licorice, cream soda and small bitter rootlike qualities. Not Your Father’s Root Beer is for everyone. It appeals to beer aficionados, as well those who don’t typically enjoy beer. Not only is it great to share with your dad this weekend, but also very enjoyable at a summer BBQ, out camping and any other warm-weather activities. Its available now in stores at a limited supply (this stuff is going fast! ), but you can also reserve it here on our website. Schlafly Pumpkin Ale is a fantastic brew made with plenty of pumpkin, squash and spice. The foundation is made from pounds of pumpkin, while flavors of fall, cinnamon, nutmeg and clove, play a supporting role. In fact, it’s one of the best widely available pumpkin beers! What sets Schlafly’s apart from the rest is its big, flavorful body, and the definite pumpkin pie vibe it has going on. Originally brewed in 1985 in Hayward California, Buffalo Bill’s Pumpkin Ale was the first commercially available pumpkin beer brewed in the United States back in 1985. This one is all pumpkin spice and lighter on the malty beer flavors found in other examples of the style. It’s made with real pumpkin and embodies a golden amber color. Enjoy it all throughout the fall season, as it is available from August to November. Herald Imperial Pumpkin is a higher octane pumpkin beer at just over 8% alcohol and is pretty well balanced, while also refreshing. It pours a ruby-amber color and the nose is reminiscent of subtlety fall smells. The overall taste is heavy and overpowering, but in a good way. The spice and malt play well together for a delicious pumpkin brew. Flat Jack is the fall seasonal ale from Flat 12 brewing in Indianapolis. In their words it’s, “a special blend of Indian(a) spices and pumpkin shine through just enough to complement this slightly sweet and malty tribute to the season of hayrides and bonfires. Flat out fantastic.” Flat Jack is full of pumpkin spices and offers a nice bitter finish. Be sure to check out our pumpkin beer selections this fall at your local Payless Liquors store. If you would like to reserve one of these beers, be sure to send us a request via our website. We hope you have a Happy Halloween full of pumpkin beers! Find A Brew Tastings are great for trying new products and finding a new favorite brew. This August our Find A Brew tastings have been all about gearing up for the fall season with beers that have an autumn feel. Below are a few of the seasonal beers we will be tasting this month. Redd’s has rolled out a twist on the classic Apple Ale with a bolder flavor that is still refreshing. Wicked Ale is crisp like an apple, yet it stays true to its golden ale roots. The taste is similar to the apple ale with low malt and hints of bitterness. It has a crisp finish that is sure to please anyone who is looking to branch out and try something new. Belgium White Ale is brewed with oats to produce a creamy and spiced flavor. This beer is the perfect combination of orange peel and coriander. It has a smooth taste, which is uncommon for a Belgian style. White Ale is a hazy yellow color with a small white head. The aroma is very citrusy with flavors of orange and lemon. You will also find it has a sweet taste. We recommend garnishing your Belgium White with an orange slice for some added zest! Harvest Pumpkin Ale was the first autumn seasonal brew crafted by Blue Moon back in 1995. It is made with pumpkin and spices of cinnamon, nutmeg, cloves and allspice that represent all the tastes of fall. Unlike other pumpkin ales, it’s a perfect balance of pumpkin and spices for a very smooth, pleasant taste. Not only is Blue Moon Harvest Pumpkin Ale great for drinking, but it is also great for baking. Check out this delicious recipe for Harvest Pumpkin Ale cupcakes. Made with the citrus hops Citra, Simcoe, Cluster, Centennial and Chinook, Hoppin Helles is a truly refreshing brew. The taste is a great combination of light, sweet malt with hoppy notes and infused crisp fruit. It finishes a bit bitter with a mild, citrus hop flavor. The lightness of the beer pays homage to its roots with helles – meaning light-colored in German. This August, Payless Liquors has three great beers that are sure to please your palette. These three beers are all about collaborations between different breweries in an effort to produce the ultimate brew. This beer is a collaboration between three big hopheads: Stone, Beachwood BBQ and Heretic Brewing. Unapologetic IPA is a big, fruity DIPA. It pays homage to its Cali roots with a big, bitter taste. The hop varieties cultivated in the brew provide pine and citrus aromas along with peach, orange and coconut flavors. The Belma hops also bring out berry and black currant notes. We recommend enjoying Unapologetic as soon as you purchase it, so you can experience the newly cultivated hops and all their glory. We have a limited supply available in 22 oz bottles for $9.99. Beer Camp has been creating quite a buzz among craft beer enthusiasts this summer. In fact, it received a 100-point score from none other than Beer Advocate. Sierra Nevada’s variety pack contains 12 different beers from 12 different breweries across the U.S. Some notable participants include: Cigar City, Russian River, Bell’s Victory, Firestone Walker and 3 Floyds. The pack is meant to be a celebration of craft beers with a 7-city traveling beer festival worked into the promotion of the exclusive release. The festival tour concluded on August 3rd and featured several craft brewers from each area visited. We have the Beer Camp package in very limited quantity for $25.99, which includes 10 bottles and 2 cans. West Coast DIPA was an invite sent out across America for the Beer Camp Across America Festivals. Although the invite is no longer valid, you can still purchase it at your local Payless Liquors store. This new DIPA is a citrusy, yet bitter, with five different hops. If you are a Sierra Nevada fan, you will be happy to know two of the hops being used in “Hop Torpedo” are included in West Coast. The intense of flavors of citrus and pine are present, with an incredibly smooth taste. Hints of grapefruit and floral notes, with an orange blossom flow throughout the brew. It also has a nice, dry malty finish. You can find the 22 oz cans in stores for $5.99. To insure you snag one of these extremely popular collaboration brews, be sure to submit a request via our website. What beers are you enjoying this August? Let us know in the comments below! Summer craft beers are quite the talk of the town this time of year. They are becoming more and more popular, especially within the local Indianapolis beer circle. We are thrilled to announce that this season at Payless Liquors, we are offering a majority of the hottest craft-beer products out there! Here are a few of the big IPAs we recommend you enjoy this summer. First released in 2012 to commemorate the 10th anniversary of Stone Brewing’s Ruination DIPA, RuinTen has now become a yearly release. Brewed with five pounds of hops per barrel, the process adds a heavier malt bill, balance and alcoholic depth. The dry-hopping of the brew has also doubled, with a large amount of Citra and Centennial hops. RuinTen is guaranteed to please your palate with a mixture of aromatic and resinous hoppiness. With 10.8% ABV you can buy these 22 oz. bottles for $8.99. With a 100 overall rating by RateBeer.com there is no reason not to try this IPA! Founders Double Trouble Imperial pays homage to summer with fruity and piney aromatic hop notes. The pungent scents of juicy apricot and peach flourish. Bread and caramel malt flavors also hit your tongue at first sip. This brew is meant to turn your world upside down—note the logo. Crisp and bitter, enjoy Double Trouble during these summer months. We have it available 9.4% ABV $12.99 4NR. Last, but not least, an IPA that has certainly created a buzz around the Indianapolis area: Grapefruit Jungle was the first beer by Sun King to sell out in a matter of days. The brew is a tribute to the 1955 film, Blackboard Jungle, starring Glenn Ford and Sidney Poitier. Grapefruit Jungle focuses on the citrusy high alpha hops. Flavors of grapefruit, orange and tangerine run wildly through the brew. Bursting with hop flavor and aroma, Grapefruit Jungle is any hop lover’s dream! It’s fantastic beers like this one that has allowed Sun King to become one of the best breweries in Indiana. We caution you that this product is going fast, so get it while you can! Get it for $18.99 4NR 7.5% ABV 77 IBUs. Do summer right this year and be sure to pick up at least one of these popular seasonal, craft beers at Payless Liquors. What is your favorite summer beer? Tell us in the comments below! Beer and heavy metal go together like chocolate and peanut butter. One of my favorite things about heavy metal is the amazing lyrical content and album art. With its dark and intense attitude, I could just imagine Great Divide’s Chocolate Oak Aged Yeti going on the front of some heavy metal album cover. Aged with cacao nibs and oak chips, this imperial stout’s hops are retarded just a bit to let in the flavors of chocolate and vanilla. The flavor of this beer will immediately remind you of a chocolate bar, but a dash of cayenne keeps the finish spicy and interesting. You can pick up a 22 oz right now for $11.99! Our next two beers both come from Sierra Nevada Brewing Company. The first is Southern Hemisphere Harvest IPA. This ale gets its name from the location of its hops—New Zealand. Harvest season is dreadfully short if you want the full aroma and flavor of the hops. Sierra Nevada cheated the system by harvesting crops from the southern hemisphere as well, hence the name of their brew. With Southern Cross and Motueka varieties straight from New Zealand, this ale uses hops that are picked, dried and shipped to California within seven days. The process really brings out the floral and grassy flavors of these high alpha hops. Get a 22 oz for $5.99 today! Our other Sierra Nevada brew is Hoptimum Imperial IPA. Hoptimum is the biggest, baddest and best IPA made by Sierra Nevada. It uses the huge additions of Magnum, Chinook, Simcoe and an experimental secret hop that is exclusive to the company. This all gives the ale a very hoppy, resinous aroma that you will remember. The whole cone hop process is a torpedo of ultra-intense, dry hopped flavor. A resinous and bitter beer from the start, Hoptimum has a big malty backbone to help balance the flavors. There are hints of grapefruit, rose, lilac, cedar and tropical fruit in this beer that culminates in a dry and lasting finish. Get a four pack today for $11.99! If you’re interested in purchasing one of these featured brews, just contact Payless Liquors! Heavy metal albums not included in the purchase of any beer. The India Pale Ale is one of the most popular beer styles on the market today. In fact, brewers sometimes struggle to keep up with the high demand for these typically dry, extra-hoppy ales. A common misconception is that the style was initially developed as a way to avoid beer spoilage during the long voyage to India and the hands of homesick, beer-thirsty British troops. To learn more about the true history of the IPA, read this great article by Beer Church. To learn about great new IPAs available from Goose Island, continue reading! Endless IPA is Goose Island’s venture into the “session” IPA category. This Amarillo hopped IPA is bright and crisp. According to Goose Island’s website, it was brewed to be “easy drinking and endlessly refreshing, so you can enjoy every encore” during the long days and warm nights to come. Stop by your nearest Payless store to pick up one of these new Goose Island ales. Our knowledgeable and friendly staff can help you decide which of the three you should purchase first—or grab a 6-pack of each! They won’t be around forever.